Earl Grey tea is a classic blend with a distinctive citrusy flavor and a worldwide following. Although different brands have their own interpretations, a true Earl Grey blend will always include black tea and the flavor of bergamot orange. In the late 1800s, when Early Grey first appeared, it was marketed as a mix of teas from China. Now many Earl Greys contain Indian or Ceylon teas and may leave out Chinese teas altogether. Many Earl Greys simply list "black tea" or "fine black tea" in the ingredients. "Citrusy" and "Lively" are words are often used to describe Earl Grey tea. What really makes Earl Grey stand out is the addition of oils from the rind of a bergamot orange. 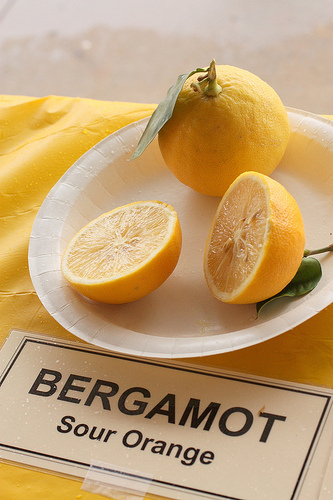 The bergamot oils give the tea a distinctive flavor and scent. See, it looks a lot like a lemon, right? The second Early Grey of Howick was a British Prime Minister in the 1830s and has a pretty weak connection to the tea that carries his name. Although the history is questionable, one account is that Earl Grey received the bergamot flavored tea and recipe as a present. The tea was a gift of gratitude from a Chinese man because the Earl's envoy to China saved the life of the man's son. It's also possible the Earl had nothing to do with his namesake tea. Around the same time period, British tea dealers were known to add bergamot flavor to emulate higher quality Chinese teas. London tea sellers Twinings and Jackson's of Picadilly have each laid claim to the blend's original recipe. Twinings even attained a seal of approval from Richard, the sixth Earl Grey. 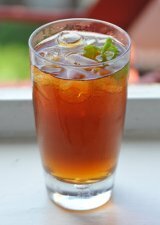 However the concept of adding bergamot oil to tea leaves originated, the special taste has been a huge hit. The term "Earl Grey" is now synonymous with tea that has a refreshing citrusy flavor. It is a popular blend found in kitchens and tea shops around the world. Tip: Try adding a slice of lemon to compliment and enhance the already citrusy characteristics of the tea. A monthly box of tea and accessories.